If you donвЂ™t already know what a cnc machine is, it is a machine that uses special motors called stepper motors to move an object a percise distance. The difference between a stepper motor and a regular DC motor, is that stepper motors вЂњStepвЂќ, not spin. if you donвЂ™t understand, refer to this artical. There are two types of stepper motors. There is Bipolar, and Unipolar. Bipolar motors have 4 wires. 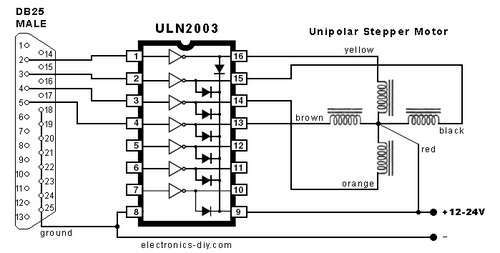 Unipolar motors can have 5, 6 and 8 wires. The difference between these two types of motors is that unipolar motors have 4 coil inside that, when energized in a certain order, allow it to step forward and backwards. This makes them easy to control and is why we are going to use them in this instructable. Bipolar motors only have two coils that can be energized in forward, or reverse. To drive a bipolar motor you need two H-bridges. Because of this, bipolar motors motor controllers are much more complex. 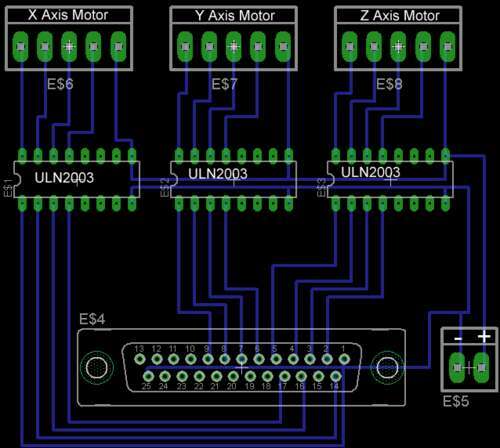 The first step to building your cnc controller is to extract your motor and control board. I did not take any pictures of this step because every scanner is different, but it is usually as simple as removing the glass and taking out a few screws. The two parts you are looking for are the stepper motor and the control board, but also keep the nice metal rods so that you can use them to test you motor. The next step is to locate the uln2003 chip on your stepper driver. If your board does not have one, you can order one online for about 50 cents. If your board has a uln2003, you must desolder the chip from the board. This step can be a bit tricky, but is not that hard. First, try to remove as much solder as you can using your desoldering pump. Once you have removed the solder, use gentle, prying force with the tip of a screwdriver. Carefully touch the tip of your iron to each pin, still applying force with your screwdriver. Now you need to solder the chip into your blank proto-board (I got mine at The Source). Solder each pin to the board. My board had two power rails running up the center of the board, so I soldered the positive pin on the uln2003 (see schematic from here and pictured below) to the one of the rails and the negative pin to the other rail. 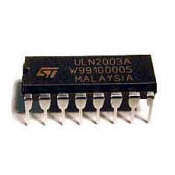 Then, you must solder pin 2 on your parallel port connector to pin 1 on the uln2003. 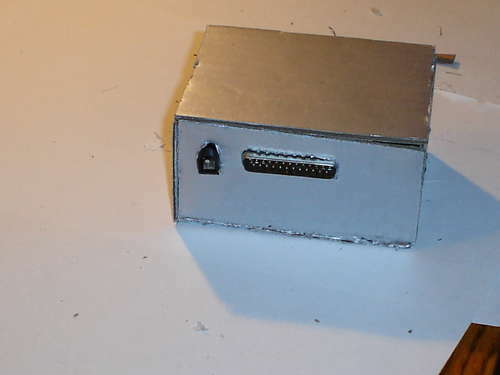 Solder pin 3 on the parallel port to pin 2 on the uln2003, pin 4 on the parallel port to pin 3 on the uln2003 and pin 5 on the parallel port to pin 4 on the uln2003. 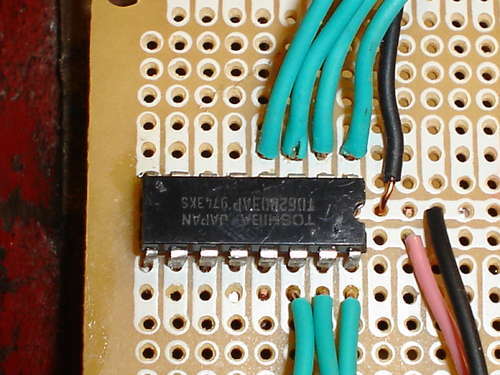 Now solder pin 25 on the parallel port to the negative rail on your circuit board. Now, solder the motor to the driver. Hooking up the motor to the board requires some trial and error. I just soldered wires so that I could use alligator clips. You could also use screw terminals or something similar. Simply solder a wire to pin 16, 15, 14 and 13 on the uln2003. Then solder a wire (preferably black) to the positive rail. Your driver is almost done. Finally, solder your barrel jack (I recycled mine from an old RC car) to the power rails on your circuit board. To prevent my wires from breaking off, I put hot glue over them. Now for the software. The only software that will work with this driver that I know of is Turbo CNC. Download it from http://www.dakeng.com/turbo.html . Un-zip it and burn it to a cd. Now, on the computer that you are going to use as your controller, go to your c: // drive and make a folder called вЂњtcncвЂќ. Next, drag the files from the CD to the folder you just made. Exit all windows. You have now installed Turbo CNC. Click start and shut-down. Then check the box that says вЂњRestart in MS-DOS modeвЂќ. You will get a command prompt. 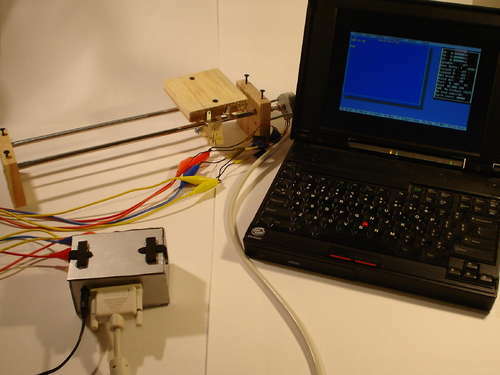 At the Prompt, type вЂњC:\tcnc\TURBOCNCвЂќ. Then you will get a screen like the one in image 3. Press any key. Now you are in the main program menu. Press F1, and then use the arrow keys to select the вЂњConfigureвЂќ menu. Use the arrow keys to select вЂњnumber of axisвЂќ. Press Enter. Enter the number of axies you will be using. I only made one driver, so I selected вЂњ1вЂі. Press enter to continue. Now press F1 again and navigate to the вЂњConfigureвЂќ menu. Select вЂњConfigure axesвЂќ, then press enter twice. You will see a screen that looks a little confusing. Do not worry, it is not that bad. Press tab until you get the box that saysвЂќDrive TypeвЂќ. Press the down arrow to select вЂ�Phase. Press tab again to select the Scale box. If your computer has a mouse in dos (mine does not), click the calc button. 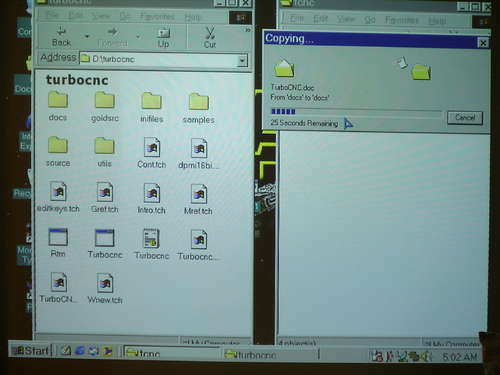 If yours is like mine, you can simply run the program off a computer running Windows XP or Vista by double clicking on the TURBOCNC file. Then, follow the above steps. Leave the rest of the boxes as they are. Select OK. You have now set up the software. The next step is to build a simple axis to use as a test system. Cut 3 pieces of wood and clamp them together. Draw a strait line on the wood to keep your holes strait. Drill two holes on the line. Finally, drill 1 hole centered below the line. Now you can un clamp your wood. Place the two rods through the holes on the line. Screw a small screw into your rods to keep it in place. Slide your second piece of wood onto your rods. Mount your motor to the final piece of wood. It does not matter how you do this, be creative. I used two pieces of 1/8 threaded rod to hold mine in place. 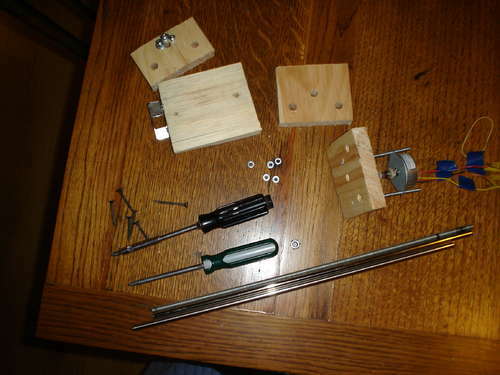 Now slide your wood with the motor attached to it on the other end of your rods. Screw the rods onto the wood. Slide your threaded rod through the third hole on your first piece. Screw your nut onto the rod. Slide the rod up to the second piece of wood. Turn the rod until it slides through the holes and up to the motorвЂ™s shaft. Using aquarium air hose and zipties, connect the motor shaft to the threaded rod. To attach the nut to the 2nd piece of wood, I used various screws and nuts to hold my nut in place, but anything should work. Finally, cut a piece of wood the size that you want your stage to be. Screw it onto the 2nd piece of wood. Make sure that your stage is level. Mine was not, so I used washers as spacers. You have now built an axis for your motor. Now you need to connect the motor to the controller. 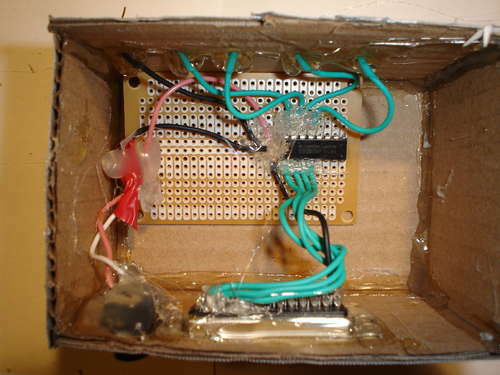 First, connect the common wire (refer to your motorвЂ™s datasheet) to the wire that you soldered to positive. Connecting the next four wires is a matter of trial and error. Connect them all and then change their order if your motor is taking two steps forward and one step back or something similar. To test it, connect your 12 volt 300ma dc adapter into your barrel jack. 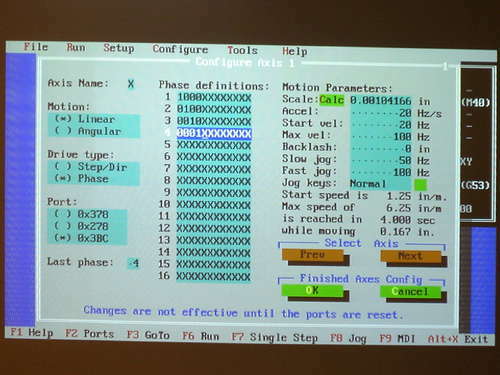 Then, connect your DB25 port into your computer. 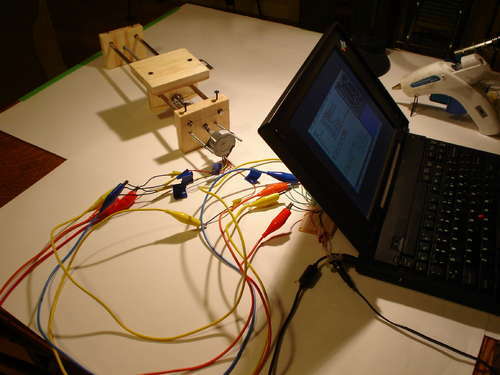 Open the attached program in TurboCNC to test your motor wire connections. When you are done testing and changing your connection you should have a fully working axis. To test the scale of your machine, attach a marker to your machine and run the test program. Measure the line. If yours is 1 inch long, or close to it, then your machine is good to go. If it is off, check your math. If you have made it this far, congratulations, the hardest part is done. Building an enclosure is the final step. 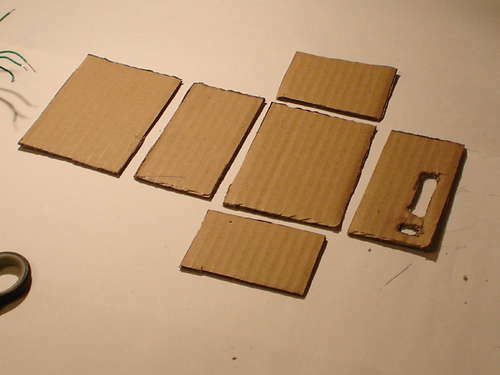 I chose to make mine out of recycled cardboard because it is better for the environment than buying a brand new plastic one. Also, since the driver is built mostly from recycled parts, it makes sense that the enclosure should be made of recycled material too. My circuit board measured about 2 inches by 3 inches, so I decide to make my enclosure 3 inches by 4 inches by 2 inches to make room for the connectors. sides. Cut it out. On the same side, trace your dc barrel connector. Cut that out too. 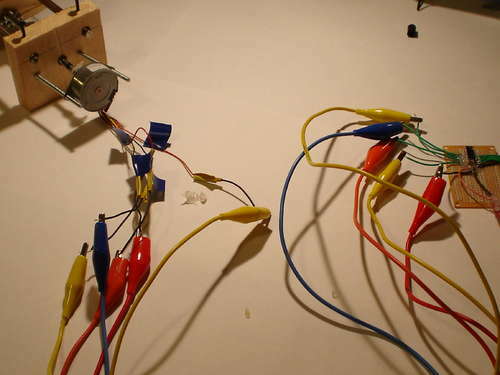 What you do in this step depends on if you soldered connectors to your motor connection wires. If you did, mount your connectors on the outside of your blank 4Г—2 inch panel. If you just used wires, poke 5 holes. Now, using hot glue, glue all of the panels together (except the top one, see pictures). I chose to paint mine silver. 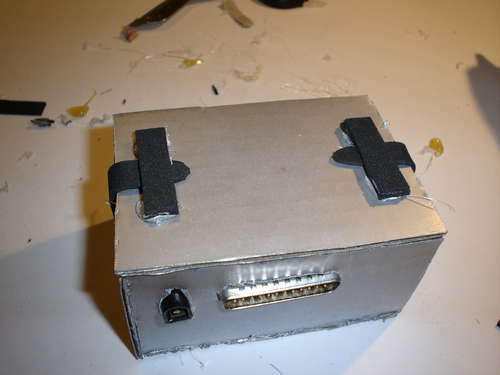 Now you must glue the componants inside the enclosure. Be sure to put lots of glue on the plugs as they will be exposed to lots of force. To keep the box closed, you need to make some latches. You need to cut two tabs out of craft foam. Next, cut two strips of foam and four small squares. Glue two of the squares to each strip as shown in the photos. Glue a tab to each side of the enclosure. Glue the strips to the top of the box. This concludes building the enclosure. -or anything else that requires a percise amount of movment. This Concludes my instructable. I hope you found it interesting and helpful. Feel free to modify my design and let me know how it turned out. If you liked my instructable, please vote for it in the Epilog Laser Cutter Contest.